Photos courtesy of Sustainable Biodiesel Alliance. 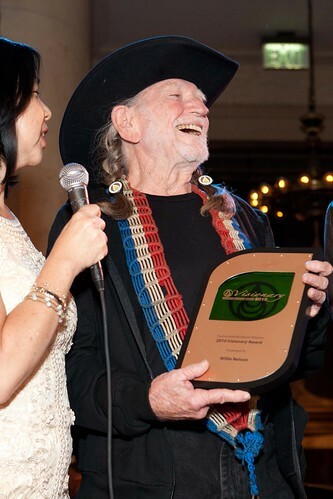 Willie Nelson was honored last by the Sustainable Biodiesel Alliance, and the Amazon Watch, when they presented him with the 2011 Visionary Award, as part of their Summer Fundraiser in San Francisco. Willie performed at the event, along with Sara Wasserman, – Dan Hicks, Tommy Castro, Narada Michael Walden, Randy Emata, Jaz Sawyer, Robin Sylvester and members of The Legendary Glide Memorial Choir-, — and many others at their fundraiser. Every year the Sustainable Biodiesel Alliance honors an individual or an organization for championing the cause of the environment, and for challenging the status quo in order to bring about real change. This year the SBA honored Music Legend Willie Nelson for his continued support of environmental and social causes through his work, his music and his life. Amazon Watch partners with indigenous and environmental organizations campaigning for human rights, corporate accountability and the preservation of the Amazon’s fragile and priceless ecological systems. Amazon Watch is a known leader in protecting the rainforest and advancing the rights of indigenous peoples in the Amazon Basin. To learn more about the great work of Amazon Watch check out their website at www.amazonwatch.org. For information about the work of the Sustainable Biodiesel Alliance, information about sustainable biodiesel, how to get involved and how you can support the SBA, visit their website. Jennifer Raiser went to the Sustainable Biodiesel Alliance event in San Francisco last night, and posted this. To read her entire post, visit her web site. “And while the evening stretched on with no Willie in sight, beyond the Melons organic catering, beyond the Michael Jang rocker photos and signed Bob Weir guitar in the auction, beyond the smooth introductions and transitions by “Tao of Willie” author Turk Pipkin, beyond the extended but excellent performances by the earnest Sara Wasserman, the soulful Glide Memorial Church Choir Trio, the engaging Dan Hicks and His Hot Licks, the bluesy Tommy Castro, there was a Nelson. First biofuel spokeswoman Annie Nelson, who took the stage, Thelma-and-Louise style with Sustainable Biodiesel Alliance Director/Founder Kelly King to share her impassioned message of decentralized, local energy with to the equally impassioned audience. Read entire article at her web site. The Sustainable Biodiesel Alliance (SBA) was founded in December 2006 by biodiesel pioneer Kelly King, activist Annie Nelson and film maker Daryl Hannah. Since then, the SBA has grown to include family farmers and farm organizations such as Farm Aid, the Institute for Agriculture Trade and Policy (IATP), members of the 25 x 25 coalition, environmental organizations including the EPA and NREL, renewable energy experts and NGO’s and university programs across the country. The SBA addresses issues concerning the sustainability of the U.S. biodiesel Industry through three initiatives. The primary mission of the Sustainable Biodiesel Alliance is the completion of an independent sustainability certification system for U.S. Biodiesel Feedstock, Production, Distribution and end use fuel. SBA programs also focus on educating the public on the values of community-based biodiesel systems and how local, sustainable biodiesel can help the U.S. move towards energy, economic and environmental security. Third, the Sustainable Biodiesel Alliance provides tools for sustainability to biodiesel consumers and the biodiesel industry through our website and membership. By working with biodiesel consumers and the biodiesel industry, and promoting the value of sustainable community-based systems,the SBA is bringing people together to build a sustainable energy future that benefits all sectors of society. The Sustainable Biodiesel Alliance relies on the hard work and dedication of our working Board of Directors, the SBA Staff and the expertise of the SBA Advisory Council to achieve the goals of the organization. These dedicated and driven individuals come from all areas of the industry and each contribute unique and valuable skills to the mission of the SBA. 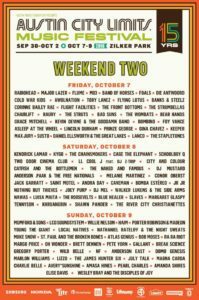 Courtesy of Willie Nelson, you and a guest will receive 2 single day passes to the Austin City Limits Festival, for Sunday October 9th, a special guided tour of the festival’s backstage and artist compound area and then meet with the man himself, Willie Nelson on his tour bus ‘The Honeysuckle Rose’. You and your guest will be allowed to get a photo with Willie and bring one personal item each to be signed by Willie at the meeting. The SBA is honored to be a part of the HOMEGROWN Village at this year’s Farm Aid 30. Come see us in Chicago on Sept. 19th. The Sustainable Biodiesel Alliance has been dedicated to supporting sustainable, community-based biodiesel programs since 2006 and works closely with artists like Willie Nelson, Jack Johnson and Guster, educating fans and sourcing locally produced biodiesel and blends for tours, festivals and large scale fleets. The organization is also focused on creating transparency for the consumer through the development of a certification system for local, sustainable biodiesel in the United States. 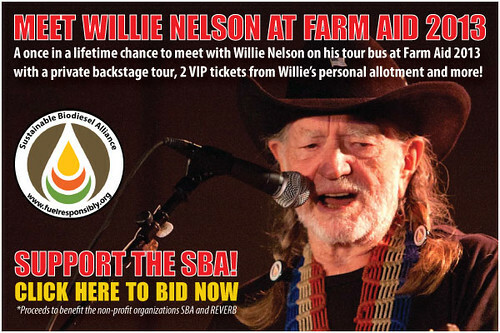 Here is your chance to watch Willie from the side stage at Farm Aid AND help out SBA, @Farm Aid and REVERB! Bid on a once-in-a-lifetime opportunity of meeting Willie Nelson on his tour bus, and receiving two tickets to the 2015 Farm Aid Concert in Chicago on September 19, 2015. This year marks the 30th anniversary of Farm Aid — the one-of-a-kind annual music event that Willie Nelson, Neil Young, and John Mellencamp founded in 1985 to benefit America’s family farmers. 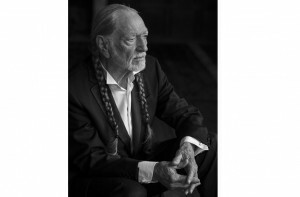 Now, Willie would like to personally invite you to join him for Farm Aid 2015 in Chicago. Meet the iconic artist on his tour bus, visit backstage with a member of Willie’s personal camp, and score two premium concert tickets taken directly from his personal stash. On September 19, music royalty awaits as you and a guest step onto the Honeysuckle Rose, Willie’s legendary tour bus. Hop aboard Willie’s caravan and have a once-in-a-lifetime chat with one of music’s most influential artists before you pose for a photo and have him sign an item of your choice. Before the show, join Willie’s former tour manager for a private tour backstage. With Neil Young, John Mellencamp, Dave Matthews and other rock legends in the line-up, there’s no telling who you might run into. Then watch the show from fantastic seats as Willie leads an all-star cast in a rock ‘n’ roll celebration of America’s heartland. That could be you sitting where lucky Joe Nick Patoski is sitting! 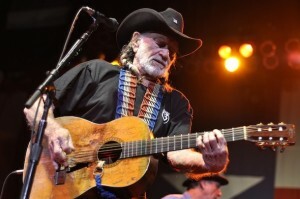 Willie Nelson has kindly donated some of his personal time to be offered to help raise funds for the Sustainable Biodiesel Alliance, Farm Aid, and Reverb. Grab a friend and head to Farm Aid 2014 on September 13th to join the ranks of rock royalty to meet with Willie Nelson on his legendary tour bus. Access to his home on the road is usually reserved for Willie’s family, friends and the occasional superstar or luminary. This is a once in a lifetime opportunity to get personal access to an American legend and get a behind the scenes glimpse into his world. Farm Aid 2014 lineup includes Willie Nelson, Neil Young, John Mellencamp, Dave Matthews, Jack White, Jamey Johnson and more. 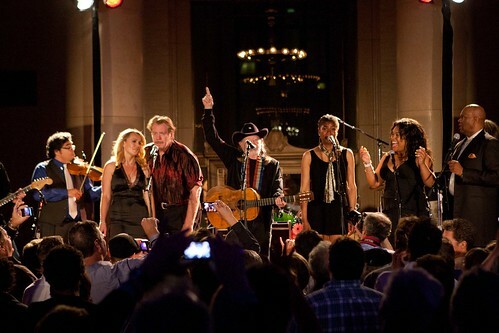 Proceeds benefit Sustainable Biodiesel Alliance, Farm Aid and Reverb. Hundreds of citizens are set to testify in support of climate action at the Environmental Protection Agency’s (EPA) hearings this week in Washington. People are speaking out in support of the EPA’s recent proposal to reduce the nation’s biggest source of polution blamed for climate change — carbon emission from power plants. This plan is the EPA’s boldest, most promising proposal todate, part of an aggressive effort to cut climate change-causing pollution by 30% by 2030. Everyone is invited to get involved and become part of the conversation. 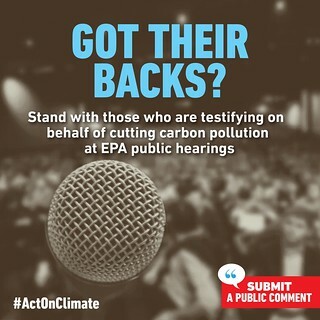 Go to: http://www.actonclimate.com/me/ to record your own comments and opinions on the proposal during the 120 day period. 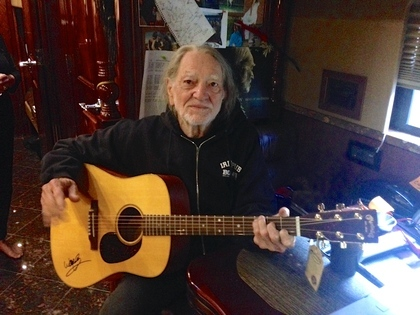 Signed by American Legend Willie Nelson this brand new Martin SWDGT was created in accordance with Martin’s responsible guitar building practices. The wood used to build this guitar originated in forests managed in an ecologically responsible manner. A photo of Willie playing the signed instrument is also included. Bid on the signed, Martin Guitar here. The SBA was founded to support and encourage sustainable production and use of the renewable fuel biodiesel. In 2006, founders, Kelly King, Daryl Hannah and Annie Nelson formed the 501c3 non profit to develop tools for biodiesel stakeholders to evaluate the fuel and create a certification system for sustainable biodiesel. 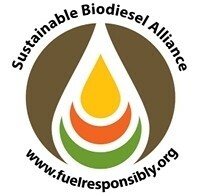 The Sustainable Biodiesel Alliance (SBA) was founded in December 2006 by biodiesel pioneer Kelly King, activist Annie Nelson and film maker Daryl Hannah to address issues concerning the sustainability of the U.S. biodiesel Industry. Grab a friend and head to Farm Aid 2013 on September 21st to join the ranks of rock royalty to meet with Willie Nelson on his legendary tour bus. Access to his home on the road is usually reserved for Willie’s family, friends and the occasional superstar or luminary. This is a once in a lifetime opportunity to get personal access to an American legend and get a behind the scenes glimpse into his world. Farm Aid 2013 lineup includes Willie Nelson, Neil Young, John Mellencamp, Dave Matthews, Jack Johnson, Amos Lee and more. This auction benefits the Sustainable Biodiesel Alliance and the REVERB Green Music Group. Don’t wait! Auction ends Thursday 9/5 at 3pm. 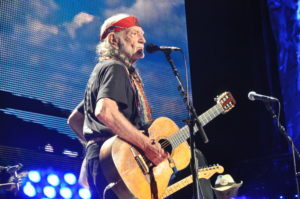 Meet Willie Nelson on His Tour Bus at Farm Aid 2013, Private Backstage Tour, 2 VIP Tickets from Willie’s Personal Allotment and More! GreenCircle and the Sustainable Biodiesel Alliance are proud to announce that the Sustainable Biodiesel Certification program is officially launched. 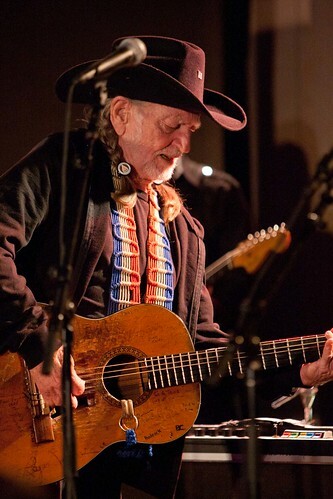 The announcement came at Willie Nelson’s 80th birthday party on June 6 at the Hard Rock Café in Times Square. At the event, Nelson and his wife, Annie, were honored for their continued commitment to advancing the use of sustainable biodiesel and for their contribution as founding members of the SBA. Recognizing the need for an objective certification system to measure the overall sustainability of the production, distribution and use of biodiesel, the Sustainable Biodiesel Alliance has partnered with GreenCircle to create this certification process. GreenCircle has adapted the SBA’s established baseline practices for sustainability to objectively evaluate the producers, distributors and end users of biodiesel. The Sustainable Biodiesel Certification program focuses on evaluating the quality of the biodiesel and the types and methods in which biodiesel blends are produced, distributed and utilized. GreenCircle will be providing third-party audits for SBA certification to objectively evaluate producers, distributors and end users in regard to the sustainability of biodiesel across the supply chain. These audits investigate and score sustainable criteria including environmental, social and economic impacts. With the support of Willie Nelson and other honorary SBA board members—including Woody Harrelson, Daryl Hannah and Jack Johnson—the Sustainable Biodiesel Certification is poised to receive national recognition for evaluating and verifying truly sustainable alternatives to traditional petroleum-based fuels. GreenCircle is excited to be an integral part of this important effort. The SBA and GreenCircle are actively seeking producers, distributors and end-users of biodiesel to participate in the SBA’s certification program. 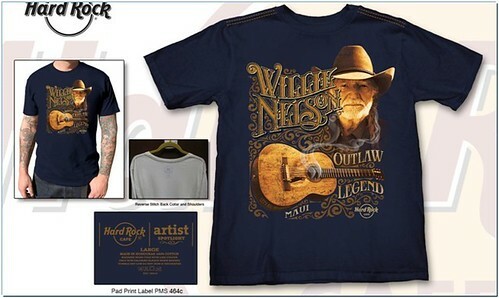 For more information, contact AshLee Klingman at ashlee@greencirclecertified.com..
Willie Nelson and Hard Rock International announced the launch of the limited-edition Willie Nelson Artist Spotlight merchandise program, benefiting the Sustainable Biodiesel Alliance and Animal Welfare Institute. The line, a partnership between the musician, activist, author and poet and the world-renowned brand, includes a men’s t-shirt, a limited edition collector pin as well as an online exclusive pin and, fittingly, a bandanna that will be available online and in-store at participating locations on June 6. Hard Rock International is excited to join in the ongoing festivities for the beloved musician and look forward to welcoming Willie and his Family Band for a celebration launch event at Hard Rock Cafe New York on June 6. A portion of the retail price will benefit both the Sustainable Biodiesel Alliance, which advocates for creating a better world through sustainable, community-based biodiesel, and the Animal Welfare Institute dedicated to reducing animal suffering caused by people and seeking better treatment of animals everywhere—in the laboratory, on the farm, in commerce, at home and in the wild. Hard Rock’s Willie Nelson Artist Spotlight t-shirt, pin and bandanna will be available online at www.hardrock.com and at Hard Rock locations in the following cities: New York, New Orleans, Maui, San Antonio, Nashville and Houston. The Artists Spotlight Series is among the series of events and releases celebrating the artists 80th birthday. On April 16 Legacy Recordings released “Let’s Face the Music and Dance,” a collection of new studio performances by Willie Nelson and Family. 2013 is shaping up as a banner year for the pop country patriarch, who turned 80 April 29. His rollicking memoir, “Roll Me Up and Smoke Me When I Die – Musings from the Road,” published by HarperCollins in May 2012, is currently a New York Times bestselling nonfiction title and “Let’s Face The Music And Dance” is an essential addition to the outlaw country artist’s catalog of timeless recordings. 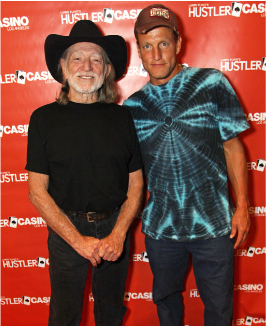 On September 27, 2010 Willie Nelson and actor Woody Harrelson hosted Willie & Woody’s All Star Texas Hold ‘Em Charity Tournament at the Hustler Casino in Los Angeles, California. They joined other celebrity friends and 200 other registrants and guests in a no-limit tournament that also included a dinner and a silent auction. Proceeds from the event went to benefit the Sustainable Biodiesel Alliance, a nonprofit organization which works to educate the public about community-based biodiesel efforts. 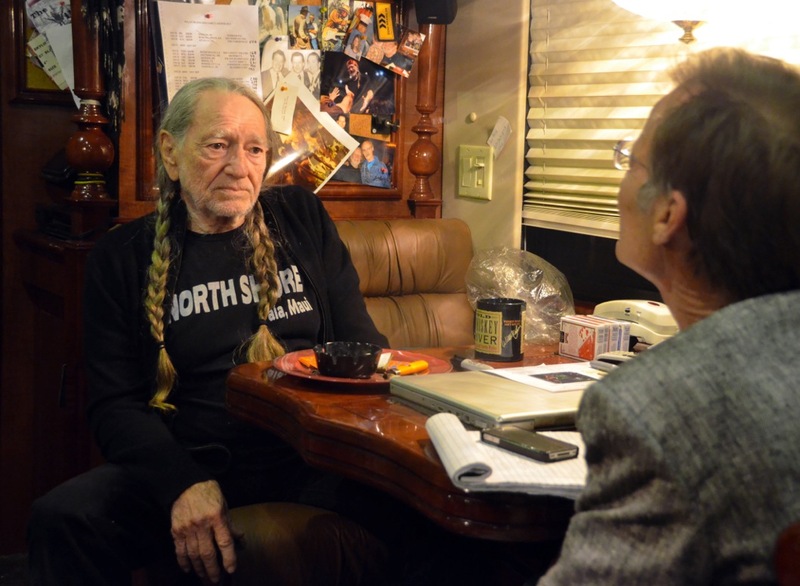 Willie Nelson runs his tour bus on biodiesel. (Gardena, CA) — “I might be a loser, but I’m a WINNER…we’re all winners!” exclaimed David Arquette at the first annual charity poker tournament to benefit the Sustainable Biodiesel Alliance. Players from around the country converged on the Hustler Casino Los Angeles for Willie and Woody’s All Star Texas Hold’em Tournament. Celebrities including Larry Flynt, Hank Azaria, Peter Farrelly, Mila Kunis, Anne Heche and David Arquette joined tournament headliners Willie Nelson and Woody Harrelson for an evening of fun at the Hustler Casino Los Angeles on September 26th, 2010. 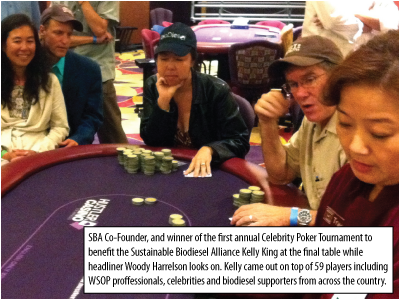 The evening’s tournament and silent auction helped raise over $40,000 to support the work of the Sustainable Biodiesel Alliance, a 501(c)3 non-profit dedicated to promoting community-based sustainable biodiesel in the United States. “Because of America’s reliance on imported oil, we simply have no adequate policy for the conservation, production or distribution of fuel and other petroleum products. As a businessman and close friend of Harrelson and Nelson, I was happy to support their important work towards a more effective energy policy. The evening was a great success and Hustler was proud to take part.” said Larry Flynt. The tournament wound up at 3am Tuesday morning and when the dust cleared after 7 hours of play, Kelly King of Pacific Biodiesel won first place in the field of 59 players. Terry Robert Doering, Jeff Scott, James “Butch” Worley and Rob Walker rounded out the top five places in the tournament. Austin, TX– On September 16th, American Icon Willie Nelson will take the stage in Camp Verde, Arizona to support the efforts of the Sustainable Biodiesel Alliance and spread the word about sustainable, community-based biodiesel. Nelson has donated the proceeds from his show at the Cliff Castle Casino to the non-profit for their work in sustainability evaluation and retail certification and transparency. Is renewable energy sustainable? How do you know if your choice is the best choice for the environment and the community? Transparency is the key, and the Sustainable Biodiesel Alliance is dedicated to supporting community-based, sustainable biodiesel and transparent, local retail models. When asked why community-based, sustainable biodiesel? Honorary Board Chairman and long time SBA supporter, Nelson commented that “its better to be the man with the tools that to be a tool for the man”. The SBA has developed a Sustainability Report Card for biodiesel to score the attributes of biodiesel. Over the past two years the report card has been used on mobile fleets for music tours to evaluate the impact of biodiesel use on the environment and economy. This year the report card was adapted into a retail certification system at eight biodiesel stations nationwide. The proceeds of the concert will be used to continue the work of the SBA and increase the number of stations participating in the program to provide more transparency to the consumer to encourage more responsible fuel choices. 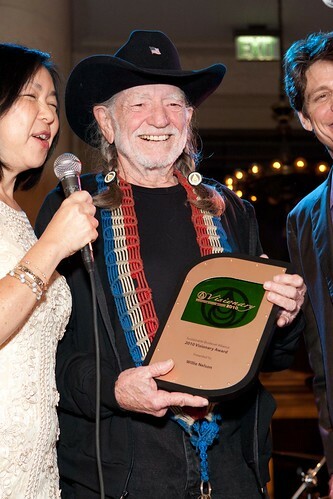 Willie Nelson was honored last Friday by the Sustainable Biodiesel Alliance, and the Amazon Watch, when they presented him with the 2011 Visionary Award, as part of their Summer Fundraiser in San Francisco. Willie performed at the event, along with Sara Wasserman, – Dan Hicks, Tommy Castro, Narada Michael Walden, Randy Emata, Jaz Sawyer, Robin Sylvester and members of The Legendary Glide Memorial Choir-, — and many others at their fundraiser.